Magnetic polish has been one of the huge things for the polish world lately and lots of brands are now releasing collections. Lovely Christina sent me over one of the nails inc. Magnetic Polishes recently and I couldn't wait to try it out! I've wanted to try out nails inc. forever as it isn't available here in Aus (yet!!) and the colours are fabulous. Today I have swatches of House of Parliament for you. Houses of Parliament is a dusty metallic purple and is just gorgeous! I applied 1 thin coat to all my nails followed by a thicker second coat and held the magnet to each nail for about 5-10 seconds before moving onto the next nail. The formula is excellent and very opaque and really easy to apply. Dry time was excellent and the brush was easy to use. I applied topcoat to my swatches which unfortunately dragged the polish a bit. The bottle has a removable outer cap which contains the magnet. The cap has a curved plastic edge to rest on your cuticle to keep the magnet from touching your wet polish when you hold it above your nail. It's sooooo easy to accidentally knock the magnet into the polish! I had to redo two nails because I dented them. The magnet is on top of the cap and is really strong! It doesn't take long for the magnet to do its thing and you're left with a cool design on your nail. My nails are large and quite curved so I found for some of my nails the effect didn't cover my whole nail. However I love the curved pattern the magnet makes and it just looks amazing in person! Have you tried magnetic polish? Thanks for looking as always! Wow that looks fantastic! I seriously wish we had that brand here in Australia, I'd be doing those sort of things constantly haha! Instant (almost) interesting mani! Ulta 3 has come out with magnetic polish and for only about $5!! I definitely agree that it's pretty much instant nail art mani. Best of all it doesn't take much effort! I'm not sure if you know but the new CLEO magazine comes with a free Nails Inc polish :) Well I only glanced at it quickly but I'm pretty sure it said Nails Inc :) Chantal. Thanks for that!! I still wish it was available in Aus right now. It's annoying having to wait for parcels! Ah it's very nice! You did a very matching pattern! Tried magnetics before but to clumsy to make the patterns alike haha! Lol thanks Moni! It wasn't me though it was the magnet and polish. 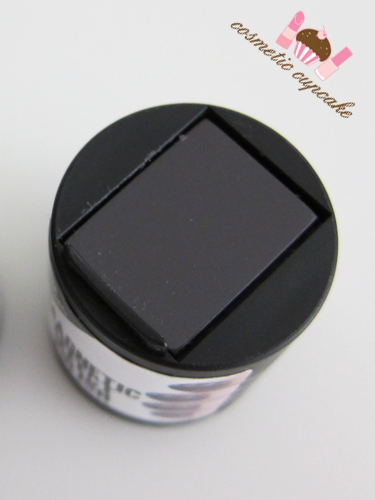 It's such an easy magnetic polish to use! Omg!!! That is so cool!!! I want ahaha! Your design looks so good!! I know right!!! Hehe thanks Karina. I love this effect a lot. Thank you so much for taking the time to let me know Natalie!!! I'm very appreciative. I think it may have been from my blogroll.. I removed it and hopefully that solves the problem. Love this- such an amazing effect. Glad you like it Michelle! It's such a cool polish! OOH I had no idea Kiko did them too now! Magnetic polishes are just so cool hehe. I couldn't get the full nail effect on some nails unfortunately as I too have curved nails. It was quite centred on some of my nails doh. The magnet is SO strong though and easy to use! It's definitely shatter polishes all over again with these new trends. I must say I love all types of nail art so I'm always sucked in haha!